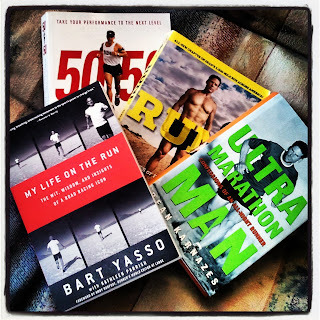 Have I mentioned that Dean Karnazes and Bart Yasso are co-hosts of the Kaua'i Marathon? Not only am I running my first marathon in Hawaii but I also get to meet two enormously inspiring and incredibly accomplished (and mostly crazy) athletes. I will likely be incoherent, I'm not so good with these things. At least I won't be dressed in an Elvis suit. Dean's books always make me want pizza, but regardless of all the fun they had, neither author makes me want to run naked. Anywhere. Ever. I had just started running before I read these books and each time I had the pleasure of discovering another one they made me believe in myself. I went out and ran farther than I ever thought I could. I mean seriously, a marathon? Me? THIS IS YOUR FAULT GUYS! Don't worry, I'll remember that at the finish line too. The Full course splits from the Half around mile 11 after gaining 251m. Both courses pass through a one hundred year old 'tunnel of trees' first. It is uphill. The Full offshoot section resembles a giant lollipop and has 421m elev gain. Lollipop Mountain! I found a blog where the runner tweeted every mile about how she was feeling. I'll be lucky if I can remember to eat. Allegedly, Full runners have arrived at the course split, noticed the impending hill, changed their minds and done the Half. The course photographers cunningly camp out at the top of big hills. I'm not the only person crazy enough to do this as their first marathon. The Finish line is right at the beach, oh yes please.